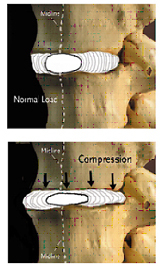 Degenerative disc disease (DDD) is part of the natural process of growing older. 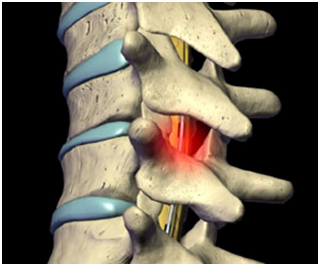 Degenerative disc disease (DDD) is a condition in which the spinal discs start to dehydrate and shrink. Degenerative disc disease causes loss of disc height and less room between the vertebrae. This condition is usually found in the neck (cervical) and lower back (lumbar) regions of the spine. Degenerative disc disease is also called spinal degeneration or simply disc disease. There are several possible causes for Degenerative disc disease. Sometimes discs becomes dry and shrunken due to leaking of protein from the disc. Degenerative disc disease can result from trauma (acute or chronic / repetitive), infection, or the natural processes of aging. It can euphemistically be referred to as the "grey hairs of the spine". A risk factor is something that increases your risk of getting a disease or condition. Radiating upper body symptoms with cervical DDD. Degenerative disc disease is diagnosed with a medical history and physical examination. During the exam, your doctor should check for range of motion and pain associated with the affected area, as well as any tenderness, numbness, tingling, or weakness. Physical therapy is often prescribed, and usually includes stretching exercises to improve flexibility and extension exercises to help maintain the spine's natural curve. A hot/cold therapy and gentle massage can also be beneficial for neck pain. After acute symptoms subside (usually within two to three weeks), patients are encouraged to begin a daily exercise regimen. This may include low impact aerobics three times per week as well as daily neck exercises. Injections : - Steroid injections around the nerves exiting the spinal cord may be able to provide some pain relief. Intradiscal Electrothermal Therapy : - Intradiscal electrothermal therapy, or IDET, involves inserting a small catheter with a heated tip into the disk. The heat causes shrinkage of the disk and deadens the disk's nerve endings. This is not yet a generally accepted method of treatment. Patients who suffer from a herniated disc, ruptured disc, or degenerative disc disease, and have failed conservative therapy are often treated with an Anterior Cervical Discectomy and Fusion. An Anterior Cervical Disectomy and Fusion has been the gold standard of treatment. Anterior Cervical Discectomy and Artificial Cervical Disc : - This procedure reaches the cervical spine (neck) through a small incision in the front of the neck. The intervertebral disc is removed and replaced with a small plug of bone or other graft substitute, and in time, will fuse the vertebrae. While Anterior Cervical Discectomy and Fusion remains the gold standard for treatment of cervical disc herniations and degenerative conditions of the cervical spine, the use of motion sparing techniques such as artificial disc placement are under investigation world wide. Read More. Cervical Corpectomy : - This procedure removes a portion of the vertebra and adjacent intervertebral discs, which allows for decompression of the cervical spinal cord and spinal nerves. A bone graft, and, in some cases, a metal plate and screws, stabilizes the spine. Read More.